Aims: The objective of this study was to evaluate the prevalence of Listeria spp. in the river water before and after discharge of the effluent of the municipal wastewater treatment plant (WWTP) in Isfahan, Iran. 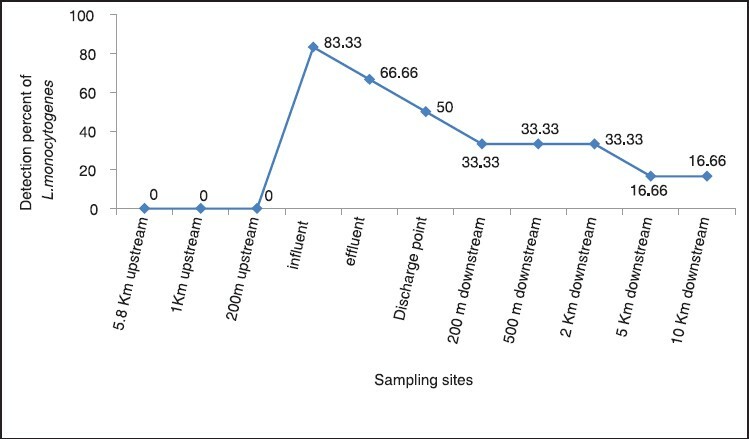 Materials and Methods: A total of 66 samples were collected bi-weekly over 4 months from eleven discrete sampling locations in Zayandehrood River, Iran. Three sampling sites were located above the discharge point and five sites were located after the discharge point of WWTP. Samples were also collected from the influent and the effluent of WWTP. Listeria spp. were isolated using a selective enrichment procedure and a subculture onto polymyxin-acriflavine-lithium chloride-ceftazidime-esculin-mannitol Agar. All isolates were subjected to standard biochemical tests. Results: L. monocytogenes was isolated from influent (83%), effluent (50%) and (18.5%) river water. Listeria spp. was not found before the discharge point in river water. However, L. monocytogenes was isolated in samples collected from 200 m (33%), 500 m (33%), 2 km (16.5%), 5 km (16.5%) and 10 km (16.5%) downstream from the WWTP. Listeria innocua (9%) and Listeria seeligeri (10%) were the second most frequently isolated species. Conclusion: During the wastewater treatment, Listeria spp. is not removed completely. L. monocytogenes is widely distributed in the Zayandehrood river. L. monocytogenes released into surface water demonstrates a potential risk for public health. These results indicate the need for appropriate water management in order to reduce human and animal exposure to such pathogens. Listeria spp. are widely dispersed in the natural environment and are able to survive in secondary and physical treatments of wastewater. Therefore, environmental authorities have been recommended a new standard for the presence of this bacterium in the wastewater sludge and municipal wastewater. This microorganism can enter the food chain, through reuse of treated wastewater like the sludge used in agriculture land (as a fertilizer) or irrigation. ,,, Transmission of Listeria to humans through consumption of vegetables/fruits irrigated with effluent of wastewater has been also reported. Therefore, continuous monitoring of water resources for the presences of Listeria is of essential to control the disease in humans and animals. Various studies have been reported the presence of Listeria spp. in raw and treated wastewater as well as in raw and digested sludge. ,, This bacterium has also been isolated from surface waters in Europe and USA. , We have reported the prevalence of Listeria spp. in various foods including plant origin foods in Isfahan, Iran. We have also reported the presence of bacterium in the wastewater treatment plant (WWTP) in the same region. However, to our knowledge, there are no data on the presence of Listeria in the surface water in Iran. Therefore, the aim of this study was to determine the prevalence of Listeria spp. in the river and assess the role of South Isfahan municipal sewage treatment plant as a source of river contamination. Zayandehrood river water supplies drinking water and irrigation of agricultural lands. The South Isfahan Sewage Treatment Plant WWTP is the largest plant in Isfahan covering a population of 700,000 people. The WWTP under investigation in this study applied for municipal wastewater treatment and located in Southeast of Isfahan, Iran. The different sampling sites along the river and influent and effluent of the WWTP are depicted in [Figure 1]. Isolation of Listeria spp. from water and wastewater samples were carried out using the modified selective enrichment and isolation protocol according to the United States Department of Agriculture method. , Briefly, 100 ml of each sample was filtrated through a 0.45 μ filter in sterile conditions. Then the filter was transferred to 9 ml of Listeria enrichment broth, University of Vermont Media (UVMI) culture medium (Merck, Germany). For the wastewater samples, 10 g was added to 100 ml of UVMI and all primary enrichment broths were incubated for 24-48 h at 35°C. 0.1 ml of the primary medium was added to 9.9 ml of the Fraser broth (Merck, Germany) enrichment medium and incubated for 48 h at 30°C. Secondary enrichment broth was then enrichment streaked onto polymyxin-acriflavin-lithium chloride-ceftazidime-esculin-mannitol (PALCAM) Agar (Merck, Germany) supplemented with PALCAM selective supplement (HC784958 Merck; Germany) and incubated at 37°C for 24-48 h. The plates were examined for typical Listeria colonies (black colonies with black sunken) and at least 3-5 typical colonies were sub-cultured on Tryptone Soy Agar supplemented with 0.6% of yeast extract and incubated at 37°C for 24 h. All isolates were subjected to gram staining, catalase and motility test at 25°C and 37°C, acid production from glucose, manitol, rhamnose, xylose, α-methyl-D-mamoside, nitrate reduction, hydrolysis of esculin and Methyl Red-Voges Proskauer test. Furthermore, for further confirmations of Listeria spp., all isolates subjected to other biochemical reactions, ί-hemolytic activity and the Christie-Atkins-Munch-Peterson (CAMP) test. The CAMP test was performed by a streak of hemolytic Staphylococcus aureus and a Rhodococcus equi culture in parallel and diametrically opposite to each other on a sheep blood agar plate. Then, several test cultures were streaked parallel to one another, but at right angles to and between the S. aureus and R. equi streaks. After incubation at 35°C for 24-48 h, the plates were examined for hemolysis reaction. L. monocytogenes 4a (IRTCC1293) strain used as a positive control for all biochemical tests. Prevalence of Listeria spp. and L. monocytogenes in the WWTP and river water samples are presented in [Table 1]. Results of the study showed that from a total of 66 samples, positive samples for Listeria spp. and L. monocytogenes were 20 (30.30%) and 18 (27.27%) respectively. 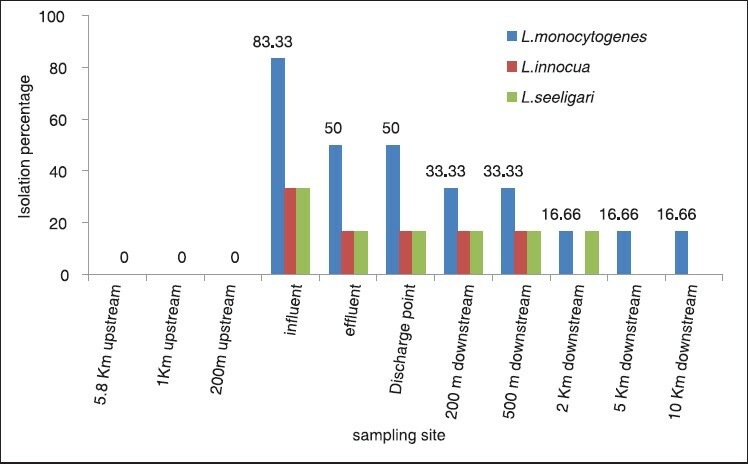 The prevalence of L. monocytogenes in samples collected from influent, effluent and river water were 5 (83.33%), 3 (50%) and 10 (18%), respectively [Figure 2]. Comparison of results related to L. monocytogenes and Listeria spp. showed that in most samples L. monocytogenes was present with other species. Other species of Listeria included in this study was L. innocua and L. seeligeri.L. seeligeri and L. innocua were detected in 10.06% and 9.09% of all samples. In [Figure 3], the percentage of the presence of different species of Listeria spp. in various sites is shown. In the present study, the prevalence of L. monocytogenes in the Zayandehrood river before and after the effluent discharge of the municipal WWTP was investigated. A total of 66 samples were taken from 11 sites in order to assess the impact of WWTP discharge to the river. Sampling along the river clearly showed the presences of Listeria were related to the discharge of municipal wastewater. Despite the discharge of industrial wastewater to the river, no Listeria was found in the river water upstream from the WWTP. Whereas, L. monocytogenes was found in 50% of samples collected downstream from the plant [Figure 3]. Results of this study indicated that the presence of L. monocytogenes in the Zayandehrood river was due to discharge of wastewater from the WWTP and significantly increased after wastewater discharged (P value < 0.05). Furthermore, this species seem highly resilient in water as it was transferred by the river to distances over 10 km downstream from the WWTP. However, non-pathogenic species, L. seeligeri and L. innocua was not found in a distance of over 2-5 km below the effluent discharge to the river. Only limited studies have been conducted on river water contamination concerning Listeria world-wide. Due to the different methods of isolation used, variation in the sampling plan and other limitations it is difficult to compare the results of the studies. For example, Arvanitidou et al. (1997) studied the prevalence of Listeria and Salmonella More Details in surface waters of Northern Greece. These authors reported low level of 3.9% contamination for L. monocytogenes compared to the current study (50%). Furthermore, logarithmic mean values of the standard bacterial index did not show any significant difference between L. monocytogenes positive and negative samples. Luppi et al. (1986) also reported a lower level of prevalence in Italy. They isolated different types of Listeria from 22% of samples taken from the PO river in Italy. In contrast, two previous studies, in Canada and Spain reported a higher prevalence of river water contamination of Listeria. , Lyautey et al. (2007) examined the spread of L. monocytogenes near the Ontario river. This river overlooks various urban and rural areas and 314 samples were taken from 22 sampling sites. The Canadian researcher reported 64% and 10% prevalence for Listeria spp. and L. monocytogenes respectively. In addition, they have found a significant correlation between the presence of L. monocytogenes and animal farming and agricultural lands in the vicinity of the river. Bernagozzi et al. (1994) assessed the spread of Listeria spp. in surface water in 94 different samples of river, brackish water and municipal sewage. These authors reported the prevalence of 74.4% for L. monocytogenes in river water. In another Spanish study, Combarro et al. (1997) examined Listeria spp. spread in the river receiving the final effluent of a WWTP, using extended aeration method in Santiago de Compostela. They have reported 92% of the mean efficiency of the treatment plant for elimination of Listeria spp. and prevalence of 44.3% for L. monocytogenes in river water. The results of the present study are in agreement with those obtained by Combarro et al. (1997)  as we also found a high load of Listeria below the discharge of wastewater. Both study clearly demonstrated that treatment to purify the wastewater in Santiago de Compotela and Isfahan does not impede the release of Listeria into the effluent, which increase the level of Listeria population in river receiving the effluent. It should be remembered that L. monocytogenes is a serious pathogen for human and animals and its release into the environment implies a significant health risk that must not be ignored. The Zayandehrood river water is mostly used for the irrigation of agricultural lands in the vicinity of the river, it is possible that contaminated water be regarded as a reservoir of Listeria via contamination of vegetable and crops grown in the land located downstream of the treatment plant. This may increase the human and animal exposure to Listeria with a consequential risk to public health. The greater concern is that the contamination of vegetables has been reported in the same area. Further study need to establish the root of transmission of Listeria to human and animal in the region. Application of appropriate molecular typing methods (pulsed-field gel electrophoresis, Ribotyping, restriction fragment length polymorphism) will provide valuable information on molecular epidemiology listeriosis in the region. Furthermore, these methods can demonstrate genetic link between human, animal, crop and vegetable (irrigated by contaminated water) isolates and river water. On the other hand, it is essential to improve the efficiency of the removal of pathogenic bacteria including Listeria in the WWTP. Meanwhile, the most-effective accomplished method of control of dissemination of Listeria is through an environmental monitoring program, which includes frequent testing. Controlling the presence of Listeria spp. in the water used for vegetable irrigation is also one the most effective means of reducing the likelihood of product contamination. Therefore, continual monitoring of river water and local plant origin foods is an essential control measure of spreading disease. The authors would like to thank the Research Vice-Chancellor of Isfahan University of Medical Sciences for financial support. 1. Farber JM, Peterkin PI. Listeria monocytogenes, a food-borne pathogen. Microbiol Rev 1991;55:476-511. 2. Lyautey E, Lapen DR, Wilkes G, McCleary K, Pagotto F, Tyler K, et al. Distribution and characteristics of Listeria monocytogenes isolates from surface waters of the South Nation River watershed, Ontario, Canada. Appl Environ Microbiol 2007;73:5401-10. 3. Hocking AD. Food Borne Microorganisms of Public Health Significance. Sydeny: Australian Institute of Food Science and Technology, (NSW Branch) Food Microbiology Group; 1997. 4. Pearson LJ, Marth EH. Listeria monocytogenes - Threat to a safe food supply: A review. J Dairy Sci 1990;73:912-28. 5. Moreno Y, Ballesteros L, García-Hernández J, Santiago P, González A, Ferrús MA. Specific detection of viable Listeria monocytogenes in Spanish wastewater treatment plants by Fluorescent In Situ Hybridization and PCR. Water Res 2011;45:4634-40. 6. Liu D. Preparation of Listeria monocytogenes specimens for molecular detection and identification. Int J Food Microbiol 2008;122:229-42. 7. Prencipe VA, Rizzi V, Acciari V, Iannetti L, Giovannini A, Serraino A, et al. Listeria monocytogenes prevalence, contamination levels and strains characterization throughout the Parma ham processing chain. Food Control 2012;25:150-8. 8. Karina P, Julio C, Leda G, Noemi Z. Behavior of Listeria monocytogenes type1 355/98 (85) in meat emulsions as affected by temperature, pH, water activity, fat and microbial preservatives. Food Control 2011;22:1573-81. 9. Schmid M, Walcher M, Bubert A, Wagner M, Wagner M, Schleifer KH. Nucleic acid-based, cultivation-independent detection of Listeria spp and genotypes of L monocytogenes. FEMS Immunol Med Microbiol 2003;35:215-25. 10. Garrec N, Picard-Bonnaud F, Pourcher AM. Occurrence of Listeria sp and L. monocytogenes in sewage sludge used for land application: Effect of dewatering, liming and storage in tank on survival of Listeria species. FEMS Immunol Med Microbiol 2003;35:275-83. 11. Toxicants NRCCo, Land PiBAt. Biosolids applied to land: advancing standards and practices. Washington, D.C.: The National Academies Press; 2002. 12. Combarro M, Gonzalez M, Araujo M, Amezaga A, Sueiro R, Garrido M. Listeria species incidence and characterisation in a river receiving town sewage from a sewage treatment plant. Water Sci Technol 1997;35:201-4. 13. Jalali M, Abedi D. Prevalence of Listeria species in food products in Isfahan, Iran. Int J Food Microbiol 2008;122:336-40. 14. Nahid Navidjouy, Mohammad Jalali, Hossein Movahedian Attar, Hajar Aghili. Performance of the municipal wastewater treatment plant for removal of Listeria monocytogenes. Int J Environ Health Eng 2013;2:1-5. 15. Eaton AD, Franson MA. Standard methods for the examination of water and wastewater. Washington, D.C.: American Public Health Association; 2005. 16. Gasanov U, Hughes D, Hansbro PM. Methods for the isolation and identification of Listeria spp. and Listeria monocytogenes: A review. FEMS Microbiol Rev 2005;29:851-75. 17. Harrigan WF. Laboratory Methods in Food Microbiology. California. USA : Academic Press; 1998. 18. Bridson E. The Oxold Manual. Bassingstoke: Unipath Ltd.; 2006. 19. Arvanitidou M, Papa A, Constantinidis TC, Danielides V, Katsouyannopoulos V. The occurrence of Listeria spp. and Salmonella spp. in surface waters. Microbiol Res 1997;152:395-7. 20. Luppi A, Rocourt J, Bucci G, Maini P. Isolation of Listeria from the water of the Po River. Boll Ist Sieroter Milan 1986;65:108-11. 21. Bernagozzi M, Bianucci F, Sacchetti R, Bisbini P. Study of the prevalence of Listeria spp. in surface water. Zentralbl Hyg Umweltmed 1994;196:237-44.